We’ve already broken the news that Chicago proper is not home to more Poles than any city outside Poland. Chicago-boosters and braggarts may be disappointed in this demographic insight, but it’s still undeniable that Chicago has a strong Polish presence and feel. After all, didn’t legendary football coach Mike Ditka call his Chicago Bears a “Grabowski team”? Isn’t it the case that there’s a first-rate Polish history museum in the city? And, isn’t every observant Catholic in the Chicago area (Polish-speaking or not) aware that Mass is celebrated in Polish in dozens of local parishes each and every Sunday? How did Chicago become such a magnet for Polish immigrants in particular? What is it that brought them to our town? Was it a particular industry? The Chicago metro’s large, dense Polish population suggests there must be a specific reason so many Poles came here. Todd suspects an industry unique to Chicago drew Poles in particular — just as hundreds of thousands of Chinese workers came to California to build the railroads in the 19th century. As it turns out, the answer has more to do with timing — a perfect convergence of broad historical processes — rather than an industry specific to Chicago Poles. We won’t aim to compete with the many books that have addressed this convergence in depth, but we can summarize what happened during the major waves of Polish migration from the 1860s through today. Chicago-based historian Dominic Pacyga (himself Polish-American) sets the scene for each, and personal accounts round out the story of why so many Poles chose Chicago above other options in the U.S. and around the globe. According to Pacyga, Chicago received a trickle of migrants from Poland beginning in the 1830s. But it really got going in the 1860s. By the mid-1800s, Poland had been annexed and divided by more powerful neighbors Russia, Prussia (which later evolved into the nation of Germany), and Austria-Hungary. Polish peasants had not been much better off than slaves until the 1860s, when the peasants were “liberated” in all three partitions. Practically, this meant Polish peasants could now own land and had some civil rights, but even the liberated Poles found life difficult under what to them was foreign rule. Nobody could teach Polish. Some noble ladies tried to teach Polish in their homes. The police found out. They capture them and took away the books and put the ladies in jail. The only way to learn Polish was at home. Liberated Polish peasants were free to leave their respective countries. Pacyga says “American fever swept through all three partitions” as hundreds of thousands of peasants sought jobs in America. Some wanted to earn enough to buy land in Poland, while others came with the intention of becoming American. Migrating Poles had several options in the United States. There were jobs available in New York, Detroit, Pittsburgh, Philadelphia, Cleveland, and many smaller cities and towns. But no American city at the time was booming like Chicago was. Pacyga compares the environment to that of today’s Silicon Valley. 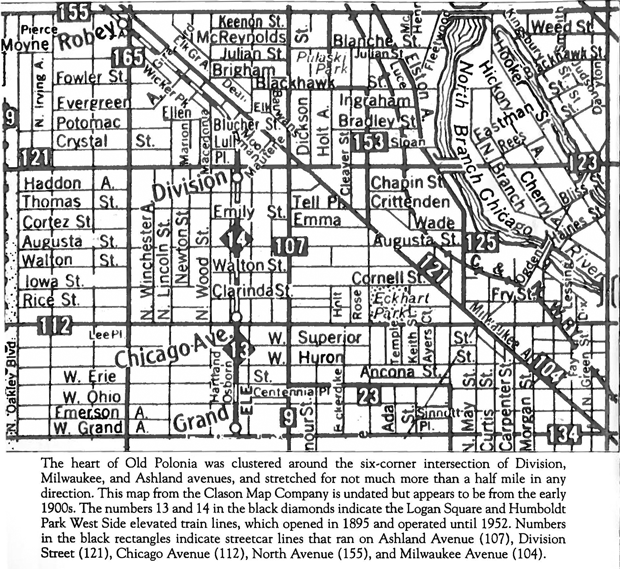 Between 1860 and 1910, Chicago’s population grew twenty-fold, from a little over 100,000 to more than two million. This massive urban growth, converging with nearly three million Poles leaving Europe, forms part of the answer to our question: Chicago’s Polish population is so large because the city’s growth occurred at just the right time to attract hundreds of thousands of Poles who happened to be looking for new homes and opportunities. Those Polish immigrants established a culture and built institutions that would attract more Poles in succeeding generations. The Archdiocese of Chicago played a part by creating Polish-friendly parishes and schools. Many of the Poles who originally intended to return to Poland decided to stay in the U.S., sending home for wives, girlfriends, children and other relatives. Albina Deptuch, recorded by the Chicago Polonia Project, remembered that her father came to Chicago around 1905, when she was a little girl. A tailor, he first tried Canada but as Deptuch said, “He couldn’t find any place to be a tailor.” In Chicago he found work for the clothier Hart Shaffner Marx, and — one by one — he brought family members to the city. Deptuch remembered that in 1914, rumors of war swept through Europe, and her father spent all he had to bring her and her mother to Chicago. He didn’t have enough to bring her two brothers and another sister, who had to fend for themselves during the tribulations of World War I. After World War I, Poland regained its independence and by the 1920s Polish migration to the U.S. began to slow. Some Polish-Americans, swept up in the optimism of the times, moved back to Poland. In the U.S., isolationism and anti-foreign sentiment brought about the passage of the 1924 Immigration Act, which drastically restricted immigration from Eastern Europe. This ended the first great migration of Poles to Chicago. World War II devastated Poland. During the war, Nazi Germany occupied much of the nation and, according to Dominic Pacyga, a staggering one quarter of the entire population was killed. Millions were enslaved in Nazi work camps, and when the war ended, Poles found their country controlled by the Soviet Union — considered a hostile occupying force by many Poles. In theory, Poles displaced in the war could return to Soviet-controlled Poland, but many worried they would be oppressed or persecuted. The story of Polish-American poet John Guzlowski and his family illustrates the dilemma faced by displaced Poles. Guzlowski explains he was born in a displaced persons camp in West Germany in 1948. He says his father, displaced during the war, tried to return to Poland but was shot at by the Soviet Army at the border. His uncle returned to Poland, but was immediately arrested as a possible troublemaker by Soviets and sent to Siberia, where he lived the rest of his life in exile. The Displaced Persons Act of 1948 allowed Poles to immigrate to the U.S., but Congress made few provisions for actually moving people from Europe to America. Regardless, Dominic Pacyga says about 450,000 Poles arrived as refugees anyway they could. Many headed for Chicago, where they could unite with relatives from previous migrations. John Guzlowski’s family spent years in different camps until a farmer in upstate New York paid for their passage from Germany to New York. The family spent a year on the farm to pay off the passage. After that year, his father chose to relocate to Chicago, even though the farmer offered the family a home and jobs on the farm. Guzlowski says his family arrived in Chicago with nothing but a steamer trunk to hold everything they owned. According to Pacyga, this story of hard work and economic success was common among displaced persons. Not everyone could buy apartment buildings, he says, but Poles found they could make a decent living in Chicago even if they only worked in factories. Immigration to Chicago slowed to a trickle after the 1950s because of the Cold War. Poles had a difficult time leaving their Soviet-block country, and Polish-Americans were rarely allowed to visit family and friends back home. Ironically, it was a protest movement against the Polish Communist government, and the ensuing crackdown, that led to a loosening of restrictions. In 1980 a dockworkers union in Gdansk went on strike to protest working conditions. This seemingly minor event touched off a nationwide protest — an expression of decades of pent-up frustration of a government understood to be controlled by the Soviet Union. The government declared martial law in 1981, and it harassed, arrested, and blacklisted Solidarity activists. During the following years, many Poles sought to leave the country. In many cases, the Polish government granted exit visas, taking an attitude that “troublemakers” who didn’t like life under Polish socialism could go ahead and leave. Janusz Majewski took the Polish government up on that offer in 1983. Majewski, now 70, tells us he sought political asylum after his involvement with the Solidarity movement. An immigration officer found a family willing to host him in Chicago. He still lives here today. Thousands of such political and economic refugees arrived in Chicago, again taking advantage of family connections, as well as secular and religious institutions that had developed in Polish neighborhoods. Kasia McCormick tells us her father had been an engineer connected with Solidarity. She was eighteen months old in 1981 when her family left Poland for a refugee camp in Austria. At the camp, other nations offered them permanent residence, including Australia, Denmark, and South Africa. Some countries offered generous refugee benefits. But McCormick says her father had already been to Chicago a few years earlier, and knew there were ample jobs for Polish immigrants. “He was like, ‘I already knew that nothing was stopping me in Chicago. I knew that if you worked hard enough, you were going make it,’” she says. Dominic Pacyga says many Poles realized Chicago not only had jobs, but a Polish-American community. After the 1989 collapse of Communist rule in Eastern Europe, Poland once again became an independent nation. With the end of the Cold War, that has meant that thousands of Polish-Chicagoans have had the opportunity to return to their home country to visit friends and family — something many thought they would never have a chance to do. Since then, Poles have continued to immigrate to Chicago. For some, the draw is to reunite with family members, as is the case with Monika Galuszka, now the Polish coordinator for Chicago’s Board of Elections. (Galuszka describes her experience in the video below). 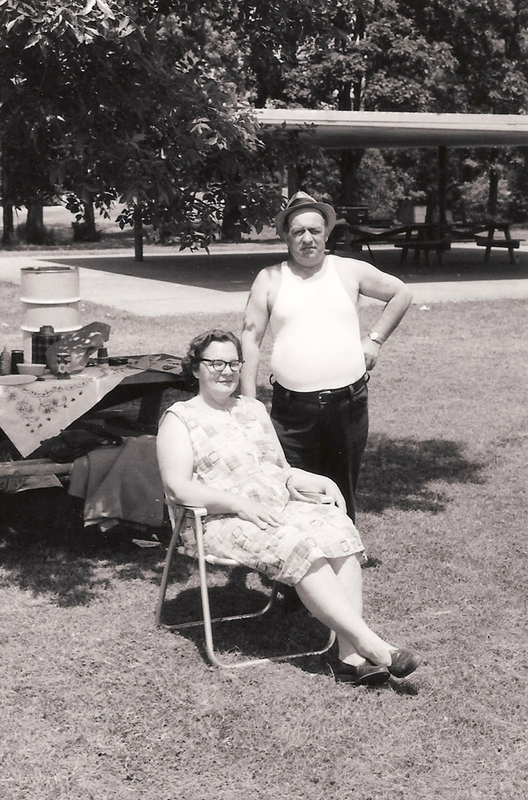 When she lived in Minnesota, Cieslak and her husband often visited friends in west-suburban Oak Park, loading up on Polish bread and sausage for their freezer. As much as they liked their community in Minnesota, she says something was off. “We missed being connected to Polish people and Polish activities — Polish media and bookstores, and [movies] from Poland.” So when their friends in Oak Park found a house they could afford, she and her husband moved, and she now helps Polish-speaking patients navigate the hospital at Lutheran General. Dominic Pacyga says the experience of Polish-Americans choosing Chicago over other perfectly nice places continues to this day, and will continue. They know there are other Polish-Americans here, he says, and that in itself is a strong draw. Special thanks to Dan Pogorzelski for connecting us with so many Polish-Americans, as well as translation help. Correction: An earlier version of this story contained an incorrect spelling of an interviewee’s name. The correct spelling is Monika Galuszka.